‘Rediscovery’ is a project I started a few years ago. In this project, I went back to shooting with only disposable cameras. I did this in order to rediscover the liberating journey of shooting just for the heck of it, much like I did as a child. I easily remember the white-haired, freckled-faced kid I used to be, who just received a two pack of ‘Jazz’ disposable cameras. I am inspired by her. I want to shoot the way she did. Yes, of course, my technical ability has greatly improved since childhood, but I am inspired nonetheless. ‘Rediscovery’ has evolved in the last two years. Not only am I shooting with disposables, but I am shooting with many other working film cameras I own. Lately I have been shooting with a 35mm Canon that belonged to my parents many years ago. I also shoot with a Polaroid Land Camera from the early 1960s, and other various instant film cameras in my collection. This ongoing project has helped me slow down and enjoy my present surroundings, which has helped calm my anxieties as well (talk about killing two birds with one stone). It has possessed me to pull my car over in rural Oklahoma, and shoot the morning fog as it passes through the branches of a large tree, much like a ghost flying presently through the crisp fall morning air. It has caused me to fearlessly shoot photographs of people walking the urban streets of New York City, a place that is unfamiliar territory for my rural-born and raised spirit. In doing this, I found myself less distracted with my digital devices, and I fell back in love with shooting photographs. The burn-out feeling that stemmed from constantly uploading RAW files and spending hours editing several digital photographs in Photoshop and Lightroom (to portray the appearance of film), is fading. The constant urge to grab my smart phone in a desperate attempt to cure FOMO is subsiding. I encourage many of you, especially photography lovers and enthusiasts that are feeling distracted by the digital age, to pick up a disposable camera (or any film camera for that matter) and shoot with it. See if it helps you like it has helped me. What are some of my favorite aspects of shooting film? Well I’m so glad you asked! Film has helped me take my time in my photography. Film is quite expensive and knowing this alone has caused me to make every single photo count. In doing this, I’ve become a lot more patient in my shooting. I try to find little details I may have overlooked when shooting digital. With digital photography, I have always had the option to click away and delete the photographs that did not make the cut. With film, my process has become slower because that option isn’t available. I shot this image while hiking at Natural Falls State Park in Oklahoma. I took my time trying to get this image to look interesting in its composition, when I got my film developed, I was really pleased with the results. When shooting with my digital cameras, I found the process of editing photographs to be a stressful one. The images rarely turn out the way I want them to. It seemed like something was missing and I couldn’t figure out what it was. I would edit and edit for hours to get my photos to portray a combination of interest and perfection. In shooting film, I found the imperfections with in some of my photographs to be quite beautiful, without unnecessary editing. 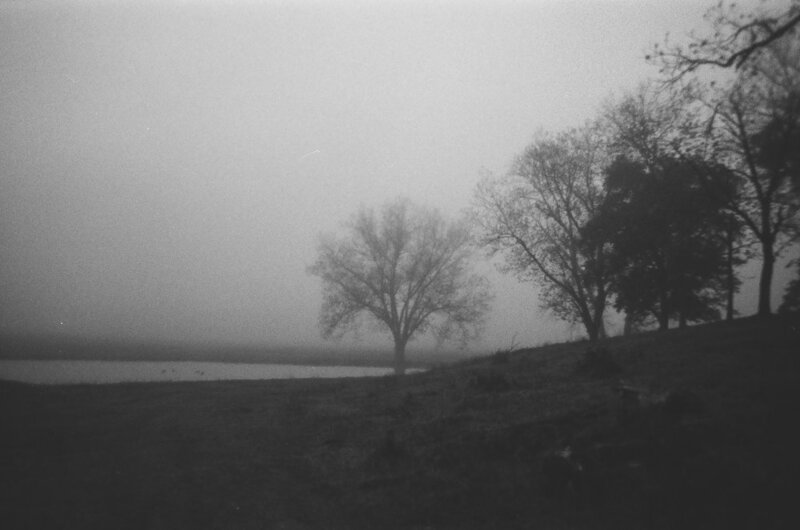 For example, when shooting with a film camera with a dirty lens, the images actually come out really interesting. It seems to add texture and roughness to the photograph. I do not get this result in my digital work. In fact, the photos turned out to have poor image quality. This has caused me to do a lot of editing to the photo, or just delete the photo all-together. Another example of compelling imperfections in film is portrayed in the photograph above. I shot this image at the top of the Rockefeller building in New York City. I accidentally left the flash on while standing behind glass (something I would not normally do). When I received the developed photo, I was ecstatic! The flash bouncing off of the glass really added interesting effects to the photo that really set it apart. In my opinion, one of the coolest aspects of shooting film is the element of surprise. Remember turning a film roll or disposable into the lab years ago, and getting really excited about opening the envelope to view your images for the first time? I really enjoyed that feeling. I still enjoy it. The image above is a very special case of this. When my sister and I were kids, my parents got us both two disposable cameras each. I misplaced one of my cameras and I didn’t get a chance to develop the film. Last year, I was cleaning out my old closet at my parents’ house, and I found the camera. It felt like digging up a treasured time capsule. I turned the camera in earlier this year. Talk about taking a step back in time! One photograph that stood out to me was this photo of my mom standing outside of my grandmas’ old house in Bristow, Oklahoma. So many incredible memories flooded my mind. I always enjoyed visiting my grandma. I remember my mom and dad purchasing this house for her. It was a home with a wonderfully interesting history. It was a former butlers quarters many years ago. I remember various visits to this house with my family, as well as the sleepovers I had there with my grandma. I love this photo of my mom, and It is interesting to see how time has passed since this photo was taken. Physical photographs are precious mementos, and slowly becoming a lost art in this digital age. I have been thinking a lot about the joy I experienced when flipping through my families photo albums as a child, intrigued by a family history that I wasn’t a part of, as well as the photographs of my sister and I when we were young children. If my husband and I decide to have children one day, I would like them to know what it is like to flip through an album full of physical photographs that tell the stories of how their parents, grandparents, and those before them grew up. This is what inspired me to first start shooting, and maybe it will do the same for them. Once I went back to shooting analog photography, I fell back in love with shooting photographs as a whole. There is a lot of freedom that goes into shooting with film, I am probably not the best at explaining that statement, I feel like it is something that needs to be discovered by doing. In my digital work, I carried a lot of camera equipment that I don’t really need when I shoot with my 35mm film camera. It has helped me focus on the experience of shooting rather than the technical aspects of it. I shot this photograph while driving to work early one foggy October morning. I pulled my car over to shoot this photograph. I really love the look of fog in a photo. It was really simple for me to just pull my car over, pull out my 35mm, and snap. When I look at this image now, I see the story in it, I remember the peaceful and crisp autumn morning when I took it. I didn’t think about the equipment I used or the anxiety it caused me to see cars passing. I didn’t worry about looking suspicious to others as I pulled out various digital photo equipment out of my car. The experience was harmonious to me. Another reason why I love film is the fact that every single photo is unique. This really comes to light when shooting instant film. I have shot many images of the same place and the images turned out extremely different from one another. The chemicals that go into these photographs add a special touch to each instant print. Once you shoot a photograph with instant film, you have only a small idea of what it will look like, and the final result is often a pleasant surprise. I shot this one in Tulsa, OK. on the outside of Circle Cinema. I love that the top of the image seems to be fading a bit with warm tones that contrast from the black and white.